This kettlebell exercise will help to increase mobility for your upper back and shoulders. 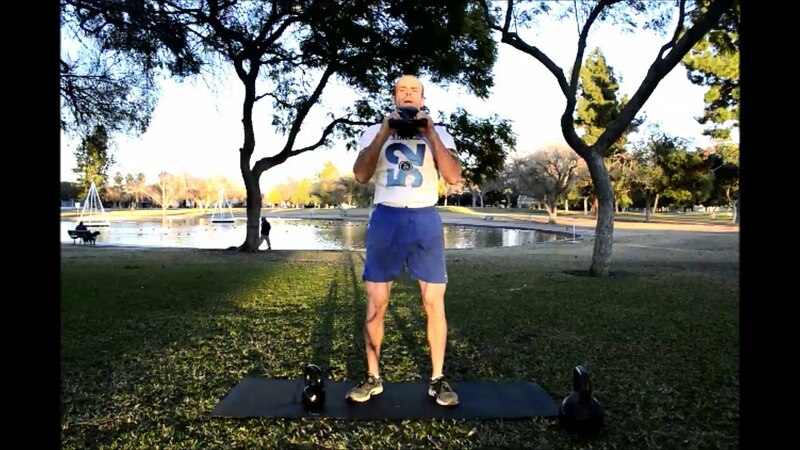 The kettlebell 2 hand push press will have you hold the kettlebell upside down by the handle. Starting at chest level, dip your hips downward and then thrust upwards. Using the momentum, you’ll press the bell overhead and then repeat several times. Like the kettlebell rack push press, a good amount of reps is 8. During my daily 20-minute kettlebell exercise route, I like to do 2 sets consisting of 8 reps before moving to the next exercise. Allow for several seconds to rest in between sets. Try to keep the bell a little bit in front of you as you press overhead. This is for safety reasons in case of losing your grip. If you enjoy the 2 hand push press, you should check out the sit up press for a full body workout. Holding the legs in the air while performing this exercise makes it a great way to activate different muscle groups. This exercise is part of the Stack 52 kettlebell exercise playing card deck which is available here. Shuffle Stack 52's Kettlebell Exercise Cards and set a timer for 20 minutes!